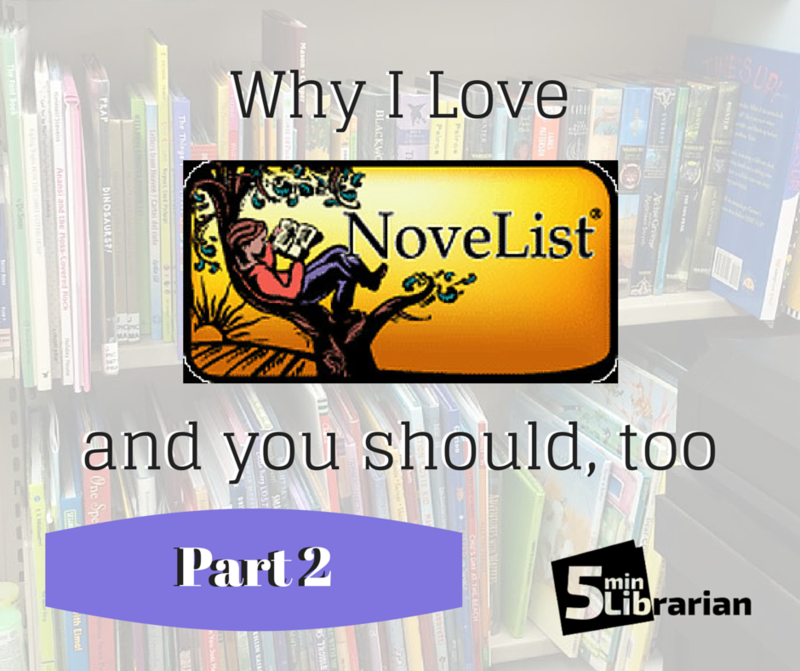 NoveList, You Have So Much to Offer! Two weeks ago, we began our NoveList journey by looking at the menu bar on the top of the page, but we've only scratched the surface of what this amazing database has to offer. There is so much more to see! 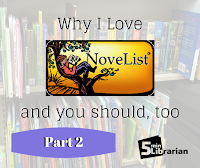 Before we dive in, I want to mention that NoveList itself has extremely helpful How-To videos and articles, and you can even sign up for NoveList training. The menu (screenshot below) is located at the very bottom of the screen. The videos are a wonderful way to get to know the database. This post is just a quick overview of the database, but I highly recommend checking out these videos for intensive assistance. Also, in the interest of clarity, I have added a multitude of screen-shots to this blog post. I know they are small, but when you double click them, they become much larger. This is such a great feature, because even the best librarian in the world can't keep up with everything. Click on this to read articles about what's new in various genres. Each category (YA, Dystopian, Romance, Fantasy, etc.) will give a brief summary of the topic, suggestions of book lists for fans of the genre, and recent titles for adults and teens. Scroll to the bottom of the page to get help with RA (particularly helpful if you're just not personally a fan of the genre) with articles written about the subject. There's also a section called "Grab This," which has reading maps and posters that you can print out to hang up in your library. Why do the work when the work has already been done for you? Bonus: they look fantastic. I grabbed this from the "Grab This" section. At the top of the main page, there is a keyword search bar, which will bring you to any book you choose. If you can't remember the title of your book, typing in a few keywords about the plot will search the database for books that match your description. Typing in "Japan 1930s women" brings up several titles, each with a quick plot summary and book cover for easy identification. As a bonus, take a look at the left side of the results page that I've screen-shotted here. You can refine the results by audience publication date, genre, and other criteria. I've used this many times for those kinds of reference questions where, "I know I read this when I was a kid in the 1960's..." Simply change the publication date and the audience, and you're golden. How is this different from GoodReads? The image on the left is from NoveList, and on the right is from GoodReads; double-click the image to see it larger. On the NoveList main page, they have a list of books that are currently popular, and read-alikes for that particular title. Personally, I find this helpful not only for RA, but also to know what people are looking up recently, since I am not able to be active in all corners of the library at once. On the right side of a book's NoveList page, there are links for "Title Read-Alikes." Clicking these links opens up a printable list of books that may appeal to fans of the original title. Each book is listed with author and a couple sentences about why readers may enjoy it. Each of these suggestions is reader-submitted; if you like, you can click the thumbs-up or thumbs-down buttons, which lets you offer feedback on whether you agree with the recommendation or not. If you are looking at the author's page, you will see a list of author read-alikes, instead. Back on the main page again, you can find lists by genre (and sub-genre! ), for all ages. Let's say that I have a patron who wants "a nice cozy mystery." Clicking on "Mysteries" will open a new tab with sub-genres... and look! There's a category called "Getting Cozy." What makes a mystery "cozy"? When in doubt, clicking on the sub-genre will open a page giving you a description of the category. We just got the fantastic news that our library system is upgrading from NoveList to Novelist Plus! What's the difference? Novelist Plus includes both nonfiction titles and audiobooks. Fabulous! I think I've hit on most of the awesome things that NoveList can do, but I wouldn't be surprised if I missed a few; there are just so many great corners of this database. Did I miss your favorite part? Tell me in the comments! Want to Read More About NoveList?